The Saladworks location at a Brown's Shoprite on Island Avenue in Philadelphia. After a successful pilot, fast-casual salad restaurant chain Saladworks this year aims to grow its presence at ShopRite supermarkets in the Philadelphia area. Saladworks opened its first-ever location in a grocery store last February inside a remodeled ShopRite, owned by Wakefern Food Corp. member Brown’s Super Stores Inc., on Philadelphia’s Island Avenue. Given the strong customer feedback, two more Saladworks restaurants are now slated to open at Brown’s ShopRite and Fresh Grocer stores in the Parkside neighborhood of Philadelphia and Wyncote, Pa., respectively, by the end of the first quarter, said Patrick Sugrue, CEO of West Conshohocken, Pa.-based Saladworks. “The store is doing extremely well. So we are expanding in the next 60 days into two more stores, with plans to grow in this category aggressively,” Sugrue told Supermarket News in an interview. If the new Saladworks outlets perform as expected, another three or four more could follow at Brown’s supermarkets within the year, he added. Westville, N.J.-based Brown’s owns and operates 11 ShopRite and two Fresh Grocer stores in the Philadelphia area. Salad bars are common in U.S. supermarkets nowadays, but Sugrue noted that many consumers consider them unsanitary and not well-maintained. “What we’re seeing with salad bars is that consumers’ hygiene standards have gone up dramatically, and for good reason. Increasingly, people are concerned about eating out of salad bars because they don’t want others reaching their hands over the food they plan to eat. They also don’t like the concept of someone possibly dropping bacon bits into the red peppers if they’re vegetarian. So we’re finding that salad bars are falling out of favor, they’re not profitable for grocery stores, they have a lot of waste and they take up a lot of space,” he explained. The Saladworks at the ShopRite on Island Avenue, situated in Philadelphia’s Penrose Plaza, takes up 150 square feet and stands in an island space near the store’s front entrance. Saladworks’ compact footprint makes it a flexible prepared-foods option, according to Sugrue. Besides made-to-order salads — with a choice of about 65 ingredients, including greens, pasta, protein and dressings — customers can get signature salads, sandwiches, paninis, soup, beverages and desserts. That means a wide range of potential meal solutions for supermarket customers. 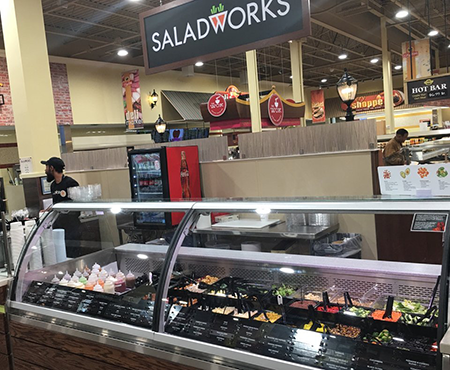 Saladworks has become a shopper destination in itself at the Island Avenue ShopRite, which also houses Southern Fried, The Wok and Brown’s Beer Garden and The Wine Cellar outlets as part of the grocer’s Chef’s Market concept. “We went in there thinking we would leverage their traffic, and certainly we are. But what we’re also finding through our marketing and loyalty program, website and social media is that people come into the store to go to the Saladworks,” Sugrue said, adding that these customers also are making other purchases while in the store. “From talking to people at Brown’s, they believe a very meaningful percentage of these guests are coming in for the Saladworks and they’re able to capture new business and differentiate themselves from other grocery chains,” he said. Currently, Saladworks has 100 restaurants in 17 states. Earlier this month, the company said it’s on track to open 17 locations this year, including 10 commitments from existing and new franchisees. Besides the new outlets in Brown’s supermarkets, plans call for Saladworks to open locations in Rhode Island, Colorado, Ohio, Virginia, California, Minnesota and Arkansas. The new restaurants will feature changes rolled out in 2018, including a smaller footprint, a streamlined equipment package, an enhanced operational model, new technology, and new offerings like warm grain bowls and aguas frescas beverages. Saladworks already has sites at Philadelphia International Airport and Chicago’s O’Hare International Airport, and it recently opened at Atlanta’s Hartsfield-Jackson International Airport. Sugrue said the chain also has a request-for-proposal to open a restaurant at Los Angeles International Airport, a licensing pact with the U.S. Air Force for foodservice sites and, later this year, plans to open at a JPMorgan office complex in Columbus, Ohio.